We’re living in an ever more-connected world, and it’s only a matter of time before absolutely everything is electronic and equipped with wi-fi. 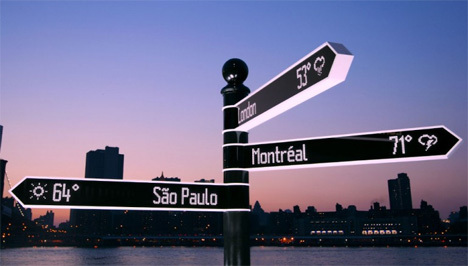 Points is a futuristic internet-enabled directional sign with arms that spin to point the way to your desired destination. A small control panel on the base of the sign gives options for places you may want to go. These options change throughout the day; for example, displaying “coffee” in the morning or “drinks” in the evening. Just push the appropriate button and the arms spin to show the three nearest destinations. 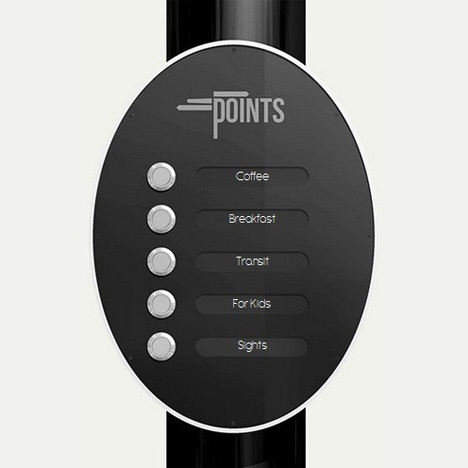 Points, designed by New York design group Breakfast, connects to the internet via Wi-Fi or Ethernet. Using social media, it can figure out if there are any special events nearby and point users toward them. It can also point tourists toward popular destinations. Another function of the nine foot tall aluminum sign is to act as a news ticker for important current events. The Breakfast team worked on the device for more than three years in order to create arms that could rotate 360 degrees without tangling wires. Breakfast is currently taking orders to place Points at special events to direct people toward important locations. See more in Futuristic or under Technology. June, 2013.